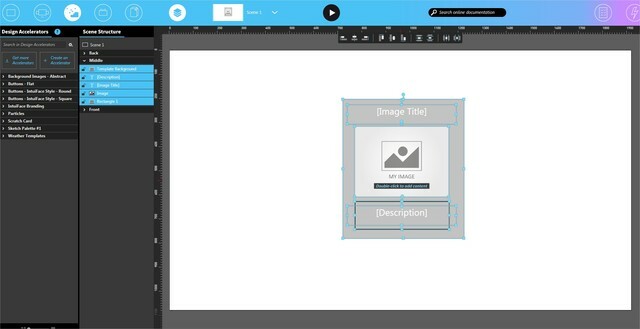 Intuiface users can create their own design accelerators. Design Accelerators can be comprised of everything from a single asset to an entire scene with all of its content. These accelerators can be used as-is or treated as templates requiring further customization. For an introduction to the concept of design accelerators, see this article. Like built-in design accelerators, custom DAs are accessible across all Intuiface projects edited on the same PC. On the left side of Composer, in the Design Accelerator panel, click the Create an accelerator button. Fill out the Create Design Accelerator panel that has now appeared and click the Create button. Note that a "Bundle" can contain more than one DA; you do not have to create a new bundle every time a new DA is created. Your DA and - if it didn't already exist - DA bundle now appear in Design Accelerators panel. To share custom DAs with colleagues, copy the relevant folders inside the above location and paste them into the equivalent location on any other PC running Composer. To customize the thumbnail image created for a custom DA, open the Design Accelerators folder as outlined above and then open the folder for your DA. Inside you will find a .png file named after your DA. You can replace this image with any other image. The maximum displayed size of this thumbnail is 100 pixels x 100 pixels. You can add any size image but it will be resized so the largest dimension is no greater than 100 pixels. Use the same filename as the original png file. You must use the png format. 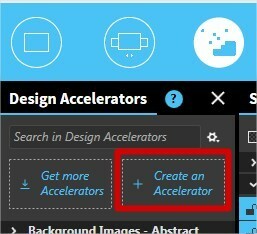 Right-click any custom DA in the Design Accelerators panel and select the Delete option.